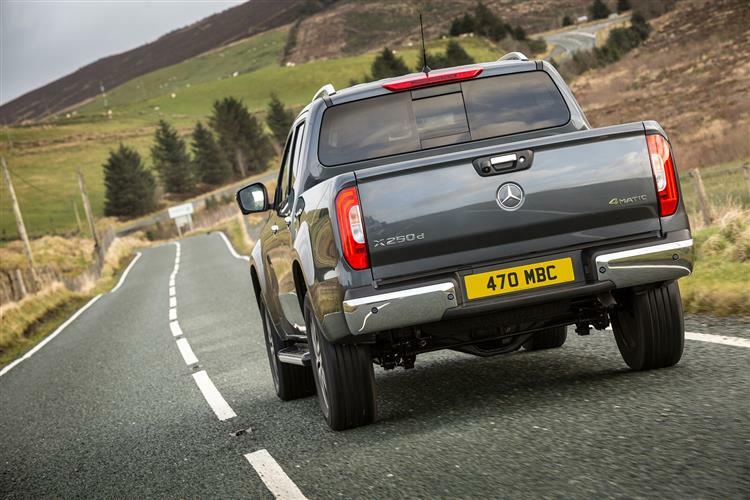 The X-Class, according to its maker, is 'the Mercedes amongst pick-ups'. Jonathan Crouch takes a look at what's on offer. In some ways, it's surprising that it's taken recedes this long to enter the pick-up segment. The company has, after all, been a competitive player n the van market for decades and it's long been established that LCV brands need to have a pick-up in their portfolios. Perhaps Stuttgart was waiting until it had just the right design to base its contender on. 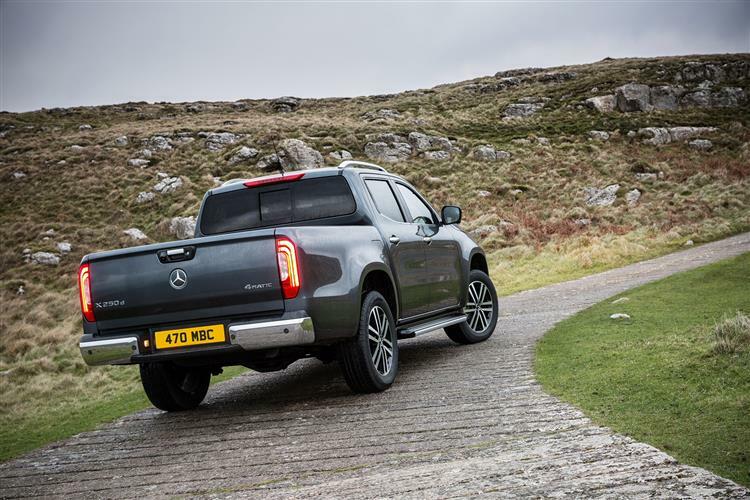 That arrived with the launch of the Nissan NP300 Navara in 2015, a pick-up featuring coil sprung suspension that revolutionised what was possible in terms of on-tarmac handling from a vehicle of this kind. The X-Class takes that engineering, then adds a bit of extra Mercedes class to it. The result is a very complete contender. The X-Class borrows its mainstream engines from the Nissan Navara NP300 pick-up model it's based upon. There's a choice of two 2.3-litre diesel units; the X220d gets a single turbo 163bhp powerplant and uses manual transmission, while the pokier biturbo X250d features 190bhp and comes only as an auto. Both models come only with engageable 4MATIC all-wheel drive. Power is transferred via a six-speed manual transmission. If you want more, then you can talk to your Mercedes dealer about the high-torque V6 diesel engine used in the X350d 4MATIC AWD variant, which offers 258bhp and a maximum torque of 550Nm. 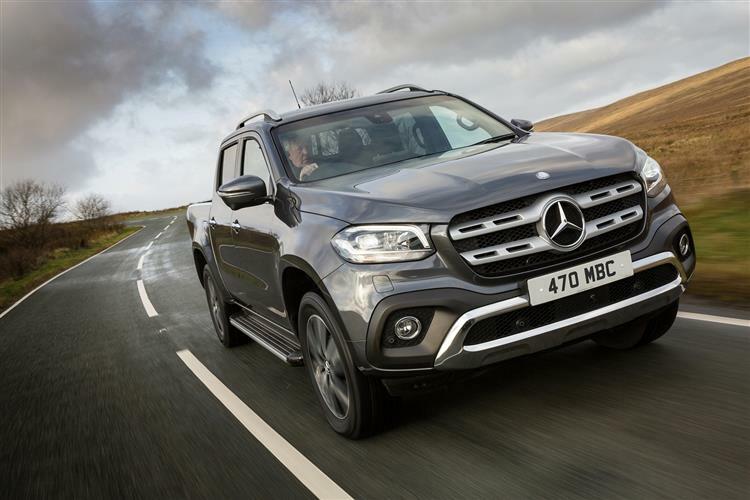 Whatever your choice of engine, Mercedes reckons that this X-Class sets a fresh standard for tarmac driving dynamics in a pick-up, without compromising off-road performance. It's helped in this by the adoption of the Nissan Navara's coil-sprung suspension system - most rivals still have a cruder leaf sprung set-up. A wider track helps cornering stability and Mercedes is the only manufacturer in the segment to opt for large, internally vented brake discs on both axles as standard. Optional is the Mercedes 'Dynamic Select' driving modes system, this kind of set-up a rare thing to find in the pick-up segment. There are five drive programs to choose from: Comfort, ECO, Sport, Manual and Offroad. These modify the engine characteristics, the automatic transmission's switching points and the ECO start/stop function. 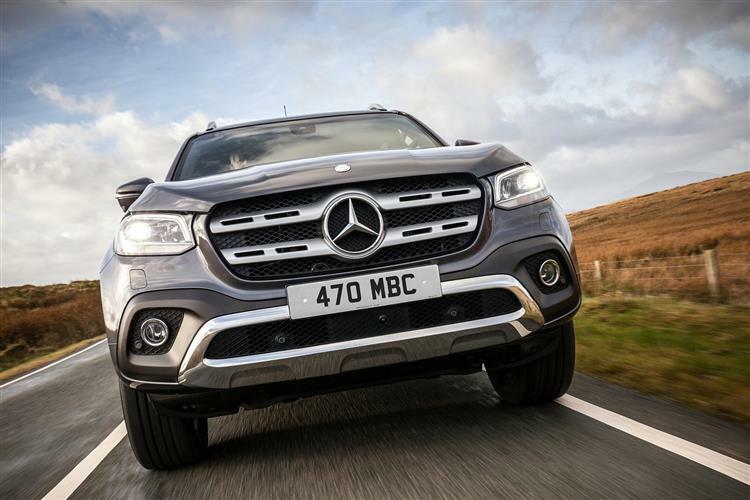 Mercedes hopes that the X-Class manages the fine balance between being both tough and stylish. A Doublecab bodystyle is the only one being offered, the design featuring a long 3150mm wheelbase, a short cladded front overhang, a backward-shifted passenger compartment and a very long rear overhang. The design of the side windows with their dynamic kink along the beltline is distinctive, while widely flared wheel arches that house 17, 18 or 19-inch rims aim to give this pickup a powerful on-road presence. Predictably, the front borrows from the looks of the brand's SUVs, with a centrally positioned star, a twin-louvre radiator grille, a high and powerfully honed bonnet and headlamps extending far into the wings. Inside, there's a classier cabin than anything pick-up buyers have ever seen before. The instrument panel has the concave trim element typical of a Mercedes and round ventilation outlets add a sporty touch. 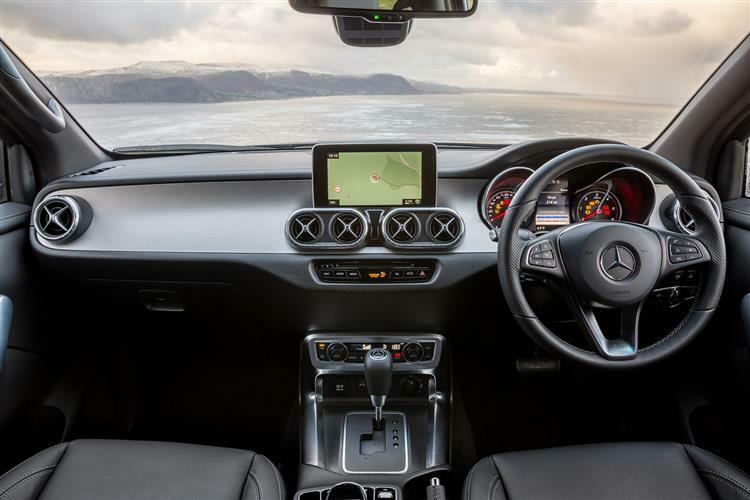 Dominating the centre of the dash is a freestanding colour infotainment touchscreen which has a screen diagonal of 8.4 inches - the biggest in the segment. Plenty of attention was paid to comfort when developing the seats, too. 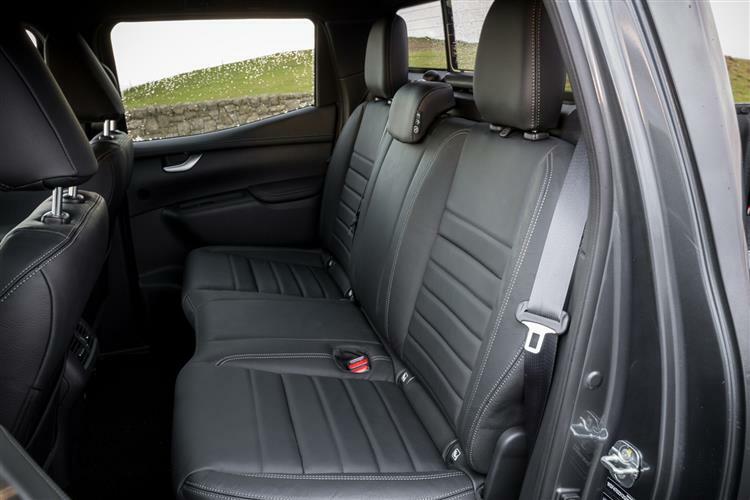 Premium materials and a seat structure featuring optimum lateral support, a high seat position and the use of ergonomically formed soft foam should make sitting comfortable for both the driver and front passenger, even on longer journeys. Prices start at around £27,500 ex VAT. Three model variants are being offered to suit different lifestyles and work environments. 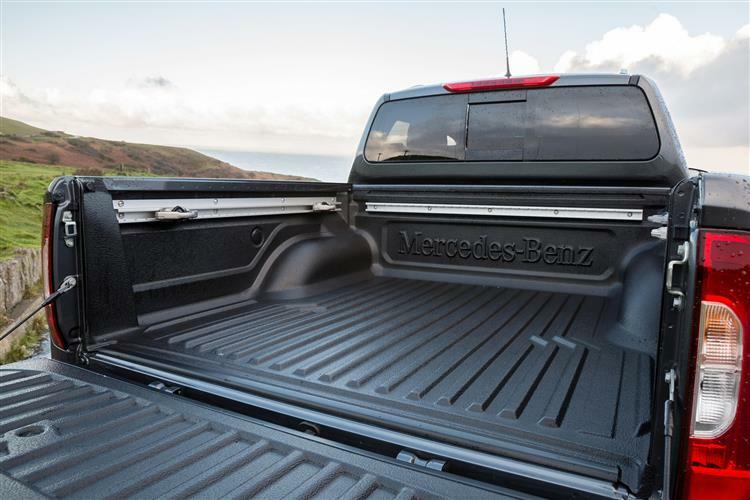 The X-Class 'Pure' basic variant is intended for rugged, functional use. 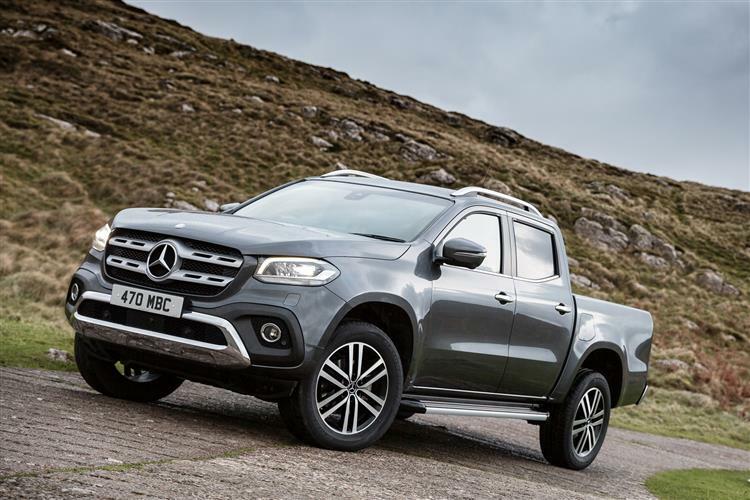 The X-Class 'Progressive' is aimed at people seeking a rugged pickup with extra styling and comfort. Finally, the X-Class 'Power' is the high-end design and equipment line. Optional equipment includes a specific 'Style Package' for the 'Progressive' and 'Power' models, this enabling plenty of individualisation. Side running boards and an electrically opening rear window are optional and there's an extensive range of other accessories. These include styling bars, side bars, soft tonneau covers, hard tonneau covers and roll covers, as well as a canopy which makes this pick-up look more like an SUV. Other items available include a bed liner, a bed divider system, load-securing rails in the floor and a technical underguard. Available safety kit includes 'Active Brake Assist', 'Lane Keeping Assist' and 'Traffic Sign Assist'. Additionally, there's 'Trailer Stability Assist', tyre pressure monitoring, an emergency call system, cruise control and LED headlamps that deliver the brightest light output in the segment. The X-Class is the pick-up buyer's Rolls Royce, easily the most desirable contender in this growing segment. Mercedes has chosen its donor model wisely, the Nissan NP300 Navara providing this contender with car-like driving dynamics that'll impress those used to the crude responses of rivals like Mitsubishi's L200, Ford's Ranger or Isuzu's D-Max. 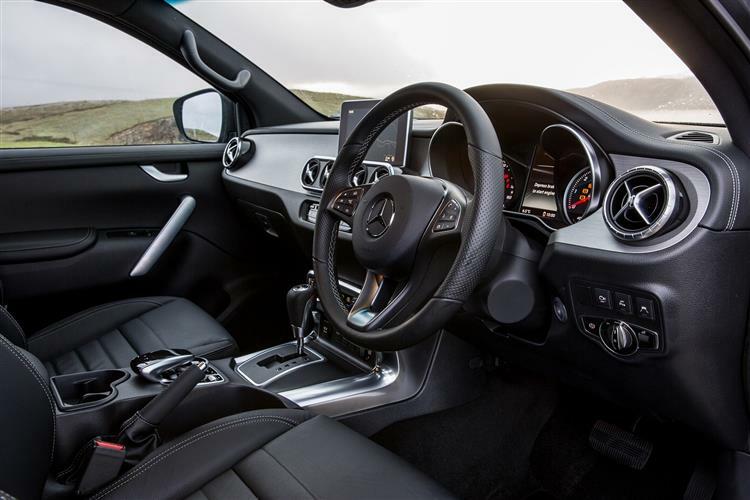 The X-Class has the smartest cabin in the sector too - and the most scope for personalisation. But would you really want to subject one to really heavy labour? If that's not on the cards but you still want a pick-up, then this one's likely to be high on your list.